Share and manage contacts with ease! Contacts form the bread and butter of every sales team. To maintain a healthy sales funnel and to go through the sales pipeline stages in a streamlined manner, you’ll need an efficient contact manager. Our fabulous small business CRM doubles as a centralized contact manager for your entire organization! 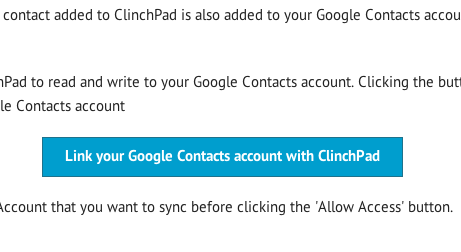 When you opt for ClinchPad, you won’t need a separate contact management software. Store as much contact and organization information as your sales process demands. 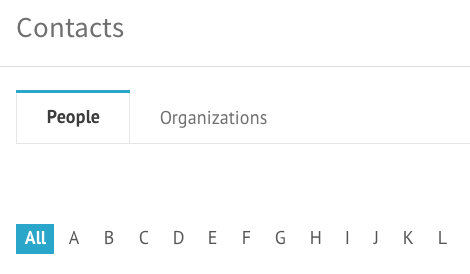 Quickly look up contacts and organizations associated with each lead and the leads associated with a contact or organization. Got thousands of contacts in your sales funnel? Thankfully, you don’t have to rebuild the contacts database in our sales tracking software. 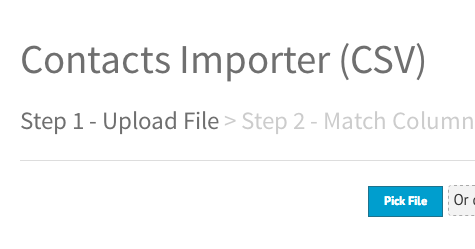 It just takes a couple of clicks to import your contacts from an CSV file, an Excel spreadsheet or Google Contacts. Now, that’s how simple it should be to use a business contact manager! ClinchPad is a crm for small businesses that brings the goodness of cloud to manage your contacts. All the contacts in your Gmail account are automatically synced with our contact management software. Contacts that you add in our sales management software are also synced to Gmail Contacts. This two way sync ensures that all the contacts in the contact manager are up to date at all times.